The main subtypes of omega-3 fatty acids are eicosapentaenoic acid (EPA), docosahexaneoic acid (DHA), and α-linolenic acid (ALA). The ratios of DHA to EPA in various studies for cognition have ranged from 1-to-2 to 2-to-1. For example, several studies of omega-3 fatty acids on Alzheimer's disease have used blends of 1.7 g DHA and 0.7 g EPA daily as the intervention.2An optimal ratio has yet to be determined via rigorous scientific investigation. Omega-3 fatty acids are a class of polyunsaturated fatty acid compounds that have more than one double bond in their backbone. 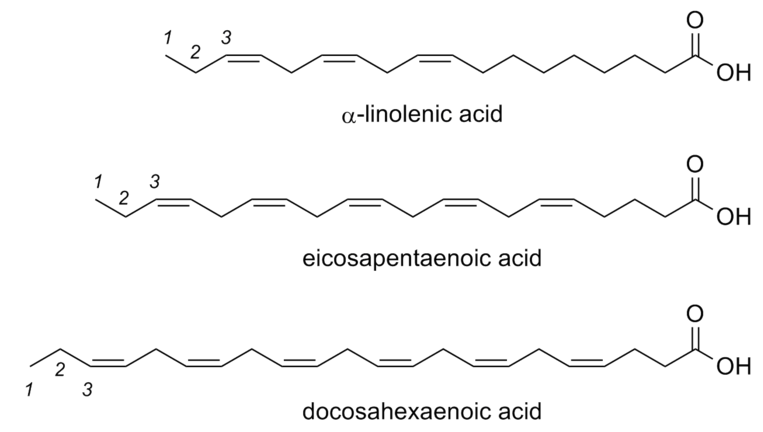 Examples of omega-3 fatty acids include α-linolenic acid (ALA), eicosapentaenoic acid (EPA), and docosahexaenoic acid (DHA). The omega-3 fatty acids are important constituents of the cell membrane - the dynamic interface between cells and the rest of the body. EPA and DHA are typically extracted from fish, while ALA is typically found in vegetable oil, nuts, flaxseed oils and grass-fed animal fats. Omega-3 fatty acids exhibit various beneficial effects on the brain. Omega-3 fatty acid supplementation has been shown in various studies to correlate with decreased rates of Alzheimer's (a component of which is short-term and long-term memory loss), but the effects were not strongly statistically significant.7,8,9. For health, 250mg of EPA + DHA is the minimum dose (this can be obtained by eating a portion of oily fish). The American Heart Association recommends 1g daily. To reduce muscle soreness you can take higher amounts, up to 6 g per day. Extreme excess consumption of omega-3 fatty acids may lead to potentially negative cardiovascular effects. Omega-3 fatty acids are FDA Generally Regarded As Safe products. Swanson, D., Block, R., & Mousa, S. A. (2012). Omega-3 fatty acids EPA and DHA: health benefits throughout life. Advances in Nutrition: An International Review Journal, 3(1), 1-7. Witte, A. V., Kerti, L., Hermannstädter, H. M., Fiebach, J. B., Schreiber, S. J., Schuchardt, J. P., ... & Flöel, A. (2013). Long-chain omega-3 fatty acids improve brain function and structure in older adults. Cerebral cortex, bht163. Osendarp, S. J., Baghurst, K. I., Bryan, J., Calvaresi, E., Hughes, D., Hussaini, M., . . . Wilson, C. (2007). Effect of a 12-mo micronutrient intervention on learning and memory in well-nourished and marginally nourished school-aged children: 2 parallel, randomized, placebo-controlled studies in Australia and Indonesia. Am J Clin Nutr, 86(4), 1082-1093. Chiu, C. C., Su, K. P., Cheng, T. C., Liu, H. C., Chang, C. J., Dewey, M. E., ... & Huang, S. Y. (2008). The effects of omega-3 fatty acids monotherapy in Alzheimer's disease and mild cognitive impairment: a preliminary randomized double-blind placebo-controlled study. Progress in Neuro-Psychopharmacology and Biological Psychiatry, 32(6), 1538-1544. Morris, M. C., Evans, D. A., Bienias, J. L., Tangney, C. C., Bennett, D. A., Aggarwal, N., ... & Wilson, R. S. (2003). Dietary fats and the risk of incident Alzheimer disease. Archives of neurology, 60(2), 194-200. Barberger-Gateau, P., Letenneur, L., Deschamps, V., Pérès, K., Dartigues, J. F., & Renaud, S. (2002). Fish, meat, and risk of dementia: cohort study. Bmj, 325(7370), 932-933. Laurin, D., Verreault, R., Lindsay, J., Dewailly, É., & Holub, B. J. (2003). Omega-3 fatty acids and risk of cognitive impairment and dementia. Journal of Alzheimer's Disease, 5(4), 315-322. Adams, P. B., Lawson, S., Sanigorski, A., & Sinclair, A. J. (1996). Arachidonic acid to eicosapentaenoic acid ratio in blood correlates positively with clinical symptoms of depression. Lipids, 31 Suppl, S157-161. Freeman, M. P., Hibbeln, J. R., Wisner, K. L., Davis, J. M., Mischoulon, D., Peet, M., . . . Stoll, A. L. (2006). 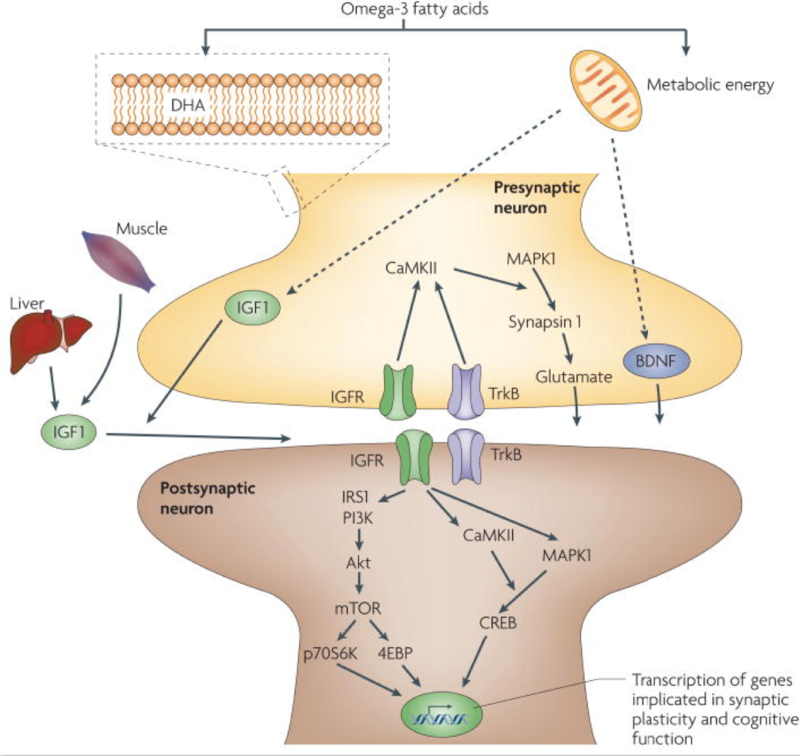 Omega-3 fatty acids: evidence basis for treatment and future research in psychiatry. J Clin Psychiatry, 67(12), 1954-1967. Peet, M., Laugharne, J. D., Mellor, J., & Ramchand, C. N. (1996). Essential fatty acid deficiency in erythrocyte membranes from chronic schizophrenic patients, and the clinical effects of dietary supplementation. Prostaglandins Leukot Essent Fatty Acids, 55(1-2), 71-75. Rees, D., Miles, E. A., Banerjee, T., Wells, S. J., Roynette, C. E., Wahle, K. W., & Calder, P. C. (2006). Dose-related effects of eicosapentaenoic acid on innate immune function in healthy humans: a comparison of young and older men. The American journal of clinical nutrition, 83(2), 331-342.